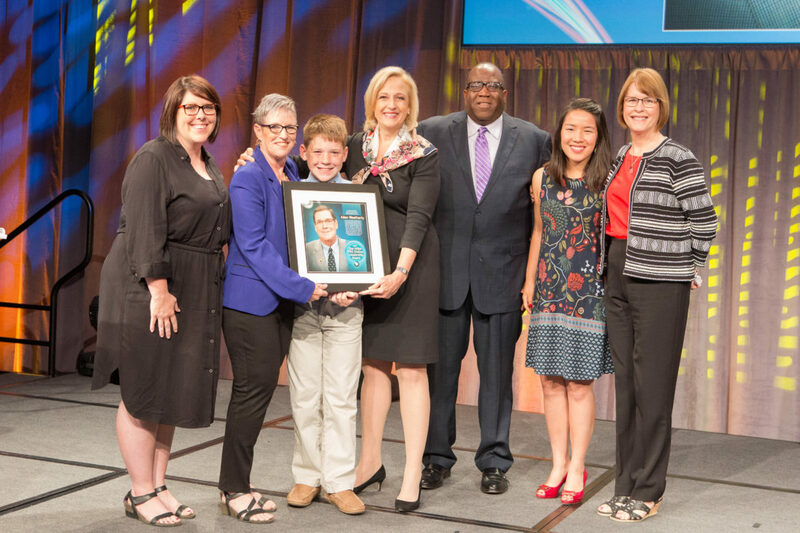 Members of the family of Allen Weatherly, recipient of the Daniel K. Miller PBS Station Leadership Award, stand with PBS President Paula Kerger (center) and Ronnie Agnew, executive director of Mississippi Public Broadcasting, at the 2017 PBS Annual Meeting Tuesday in San Diego. 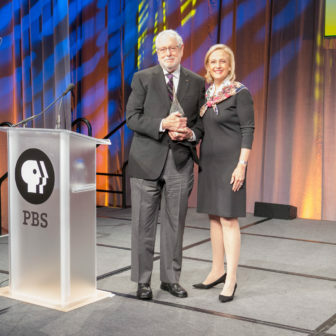 SAN DIEGO — PBS President Paula Kerger presented the Daniel K. Miller Award Tuesday to the family of the late Allen Weatherly, former executive director of Arkansas Educational Television. The award is named for the former executive director of Iowa Public Television. PBS President Paula Kerger told the crowd at the PBS Annual Meeting that she presented the inaugural award to Miller himself last year with the promise that it “will forever bear his name.” Miller led Iowa PTV as GM and executive director for 11 years, retiring in 2013 after a 37-year career. With Miller unable to attend the Annual Meeting, Kerger invited his family to the stage to describe his commitment to public broadcasting. “He truly believes in the mission and importance of free and independent public media,” said his wife, Diane Graham, who said she was a former newspaper editor and a fan of Masterpiece. “Thank you for annually honoring my father’s contributions,” she said. Kerger stepped back to the podium and, voice choked with emotion, named Weatherly, who died last fall while awaiting heart surgery, as this year’s recipient. KQED’s Earl Blauner receives the C. Scott Elliott Development Professional of the Year 2017 Award from PBS President Paula Kerger Tuesday. Also at the Annual Meeting, Earl Blauner, special counsel for gift planning and endowment at KQED in San Francisco, received the 2017 C. Scott Elliott Development Professional of the Year Award. The award was established in 1990 in memory of Elliott, who raised more than $100 million for PBS member stations in Detroit, Cincinnati and Buffalo, N.Y., throughout his career. KQED’s endowment has grown from $2 million to $67 million through Blauner’s efforts, Kerger said. She credited him for cultivating planned gifts from 500 members of the Jonathan C. Rice Legacy Society, which is named for a KQED co-founder who initiated the station’s planned giving program. 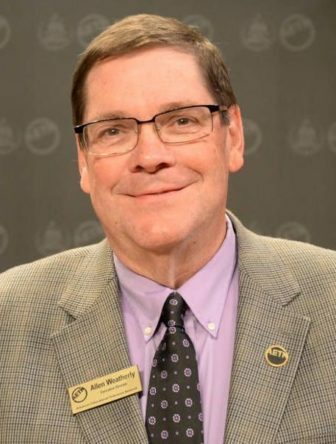 as individuals building relationships — and keep our commitment to it in face of the pressures to meet our annual fundraising needs,” Blauner said. 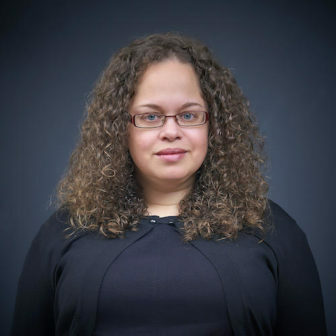 Fletcher is also interim president of the Seattle Association of Black Journalists, an editor with the mentorship program Next Generation Journalists and a former editor and reporter with KUOW in her native Seattle. She will receive the award at PRNDI’s annual conference in June in Miami. The National Friends of Public Broadcasting presented Kathleen Rae, a lay delegate with KPBS in San Diego, with its 2017 Grassroots Advocacy Award at the PBS Annual Meeting. The honor recognizes a public media volunteer or volunteer coordinator who demonstrates outstanding leadership skills in organizing, engaging in or enhancing a grassroots station advocacy program that furthers public media’s legislative goals and marshals support. Rae is the former director of government affairs and director of educational technology for Thirteen/WNET in New York City. From 1984 to 1991, she served as WNET’s director of New Jersey operations and was instrumental in the development of several major prime-time programs, including William J. Brennan, Justice for All, a recipient of the American Bar Association’s Silver Gavel Award, according to a statement from NFPB. Judy Woodruff and the late Gwen Ifill will receive the 2017 Walter Cronkite Award for Excellence in Journalism at a luncheon ceremony Oct. 19 at the Sheraton Grand Phoenix Hotel in Phoenix. Woodruff will accept Ifill’s award on her behalf. 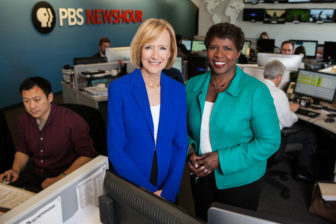 Ifill served as co-anchor and co-managing editor of PBS NewsHour from 2013 until her death from cancer in November 2016. The duo is credited with breaking new ground in journalism as co-anchors and managing editors of the NewsHour. The award is given by the Walter Cronkite School of Journalism and Mass Communication every fall. Woodruff is also the 2017 recipient of Poynter’s Medal for Lifetime Achievement in Journalism, recognizing an outstanding journalism career that has “made a lasting impact serving citizens in our democracy,” according to Poynter. Tim Franklin, Poynter’s president, called Woodruff “one of the great broadcast journalists of this generation” in a statement Thursday. Woodruff will be honored at an event in St. Petersburg, Fla., Nov. 4. Pence “values his experiences with public media,” Woodruff said at the APTS Public Media Summit.